Having been born and raised in Nairobi, Kenya, Kwanzaa is not a celebration I know much about. As I learn about the related principles and practices, I reflect on how they relate to my experience—in Kenya, Tanzania and more recently in the US and UK, and how food is entwined with creativity and identity, and it is a perfect conduit for telling the stories of our cultures. Growing up, I spent a lot of time in Tanzania—particularly at my grandparent’s farm. During the Christmas season, my mother’s siblings (6 in total) and their kids (20+, a relatively small number) would congregate there for at least a couple of weeks. Rather than address our aunts and uncles as such, we referred to them as our ‘small’ or ‘big’ mothers and fathers (relating to whether they were younger or older than our biological parents). Our cousins were simply our brothers and sisters. There is a certain level of intimacy that comes from that which, despite the fact that we are now scattered over the globe, has not faded. When we get together today, we fit right back into that level of ease and familiarity—like the parts of a unit coming back together again. Perhaps the little things like having the kids eat from one big tray instead of individual plates had something to do with building these bonds. I recall a hot afternoon where we young ones went wondering beyond our grandparent’s farm—effectively trespassing on the neighbour’s property. How did they respond? By inviting us all to relax on their porch and sample their mangoes. It does sound quite idyllic and unfortunately, such experiences are few and far between nowadays. I wonder, when I have children, will they get to experience this? How can I recreate situations that will have the same positive and long-lasting effects on them? I am a firm believer that everything starts with the self. Self-appreciation and self-esteem help us to make choices that are in our best interests and food—i.e. what we put in our bodies and how we nourish ourselves—is one of the most important choices we can make in the interest of self-determination. Both for our individual selves and for our communities. Apart from the more widely understood food-related health issues, our gastronomical decisions have an impact on our environment and wider global community. When you take an interest to go beyond the surface, you come across some very compelling perspectives, for example, regarding the trouble with agriculture. One afternoon in Tanzania, all those years ago, our parents went on strike and left the cooking of the evening’s meal to us kids. To provide some context, we were young (with the oldest few probably in their early-mid teens), and in a kitchen that did not have a stocked pantry in the same way that you might be used to today. Read: no boxes of ‘instant’, ‘just-add-water’ or ‘microwave in minutes’! Rather, sacks of rice and maize meal, fresh meat straight from the farm and an outdoor stove fuelled by charcoal. What did we do? We all chipped in and got creative. It’s creativity that has helped cultures survive, grow and evolve. It is creativity that helps us to dig deeper within, express ourselves and communicate with each other. I recently started a “Buy African” series on my blog, Afri-love, to share great African-made products that people can easily access, hopefully removing another barrier between intention and action. As a designer myself (and a proud perfectionist), I am extremely particular when it comes to what I will endorse. I want to support a business because they offer a quality product. That they make a positive impact on community should be a bonus actually be a given. Just because you’re doing good for others, doesn’t mean you should slack when it comes to the standard and presentation of your product and services. That’s my challenge to my fellow African and Diaspora entrepreneurs. Again, I believe this must start with self. You must have a self-determined sense of purpose that is not dictated by other peoples expectations of you. The collective/community level is simply a projection or amplification of what is happening on the individual level. In Kenya, there is a lot of aspiring to be like the West, at the expense of appreciating and cultivating our own unique identity. So if this is a starting point, how can we have a sense of purpose that will address and serve our unique needs? One of the key missions on my blog is to bring examples of African and Diaspora creativity and ingenuity to all who will venture across it so that people can be proud of who they are and inspired to act in ways that are true to themselves. This is what I live for! Every day I am amazed when I discover yet another example of beauty, often in the most unexpected of places or most innovative of ways. Celebrating those small (and large) joys is not frivolous as some would want to make us believe (e.g. a delicious meal or an interest in fashion). It’s creativity that has helped cultures survive, grow and evolve. It is creativity that helps us to dig deeper within, express ourselves and communicate with each other. Nothing frustrates me more than pessimism. Some people (too many of them people who look like me) have decided that nothing will ever change so, why bother trying? Harsh as it may sound, I’d rather be dead than resort to a life where I believed that to be true. Perhaps they’re thinking way too big and not appreciating the small changes they can make in their own lives with very little effort. Once you experience those small victories, you can easily visualise the mountains you can move with ambition, hard work and a healthy dose of faith. I’ve had a lot of conversations with fellow ‘continental Africans’ who dismiss Kwanzaa as something fabricated and thus somehow not valuable. When you put it in context, all celebrations are the result of human invention. Rather than use Kwanzaa as something to divide and distance ourselves from each other, instead we can take the opportunity to learn more about each other and our shared—and diverse—experiences. And, we can have that dialogue one-to-one rather than draw assumptions from stereotypes and misinformation. Here’s to knowledge, good food and a Happy Kwanzaa! Lulu Kitololo is a storyteller and ideamonger; an artist, designer and creative director. Born and raised in Nairobi, Kenya, she now lives in London and co-owns Asilia, an international creative agency that specialises in working with passionate people. Lulu founded the blog Afri-love over 3 years ago and it continues to be a space for inspiration, tips and reflections on creativity, making things happen, pursuing your passion and being true. All from the perspective of her African and Diaspora experience. Follow her via Facebook/afriloveblog and Twitter/Afrilove. 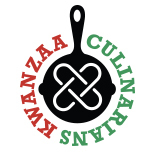 This entry was posted on December 5, 2012 by Kwanzaa Culinarians in 2012, business, Imani, Kujichagulia, Kuumba, Nia, Personal Story, Ujima and tagged Afri-love Blog, Asilia, Graphic Designer, Kenya, Lulu Kitololo.